Chocolate is a delicious treat, but is not fun anymore, if it will leave a stain on your clothes. There are a few simple recommendations, knowing that, you can easily and quickly process and eliminate chocolate stains from clothes. Fresh stains from chocolate can be deduced in the following way. The soiled piece of clothing pull over for some pot and this place slowly drip cool water. Potarite from time to time spot with your fingers. Also you can pre-moisten a cloth with glycerin and then rinse with water. On a flat surface, put a towel able to absorb moisture well, and his soiled clothes. Prepare a warm soapy solution and very carefully, using a clean piece of cotton fabric attrite spot. Then wash it as usual. RUB the stain from the chocolate with a mixture prepared from glycerol and egg yolk. Then rinse the thing with warm water and iron through a damp cloth on the reverse side. A chocolate stain can be eliminated with a solution of three parts denatured alcohol and one part ammonia. The resulting solution apply on linen, rinse with soapy water and rinse. To get the stain from the chocolate, stir in the warm water of boric acid. On a flat surface, put a towel that absorbs moisture, then contaminated clothing. Boric acid solution is spread on the stain, not RUB it. Wait for 5-10 minutes, until the solution is absorbed. Then wash clothing as usual. With colored silk the stain of chocolate can bring a few drops of oleic acid. Apply it on the affected area, and RUB with your fingers. Then a spot to wet vetochki with light gasoline. Gently wash the treated area dry and air. To remove a stain from chocolate wool materials, moisten it with a few drops of gasoline soap, then using a blunt knife scrape it. Again moisten a gasoline soap. Take vetochku impregnated with light petrol, and wipe the stain. Do not put clothes in the dryer if the stain has not disappeared. A dried stain of chocolate may forever remain on clothing, and it will be impossible to remove. Try again to remove contamination and wash linen. Do not forget that the spot must be eliminated as soon as possible. Do not delay this matter for long, as the longer you stretch out with the Laundry, the harder it is to remove the contamination. 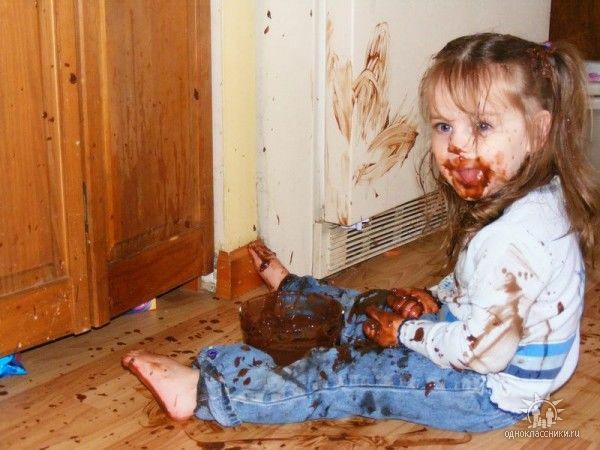 For anybody is not a secret that all children love chocolate. In this regard, mothers often have to deal with spots from this sweet clothes. There are certain simple rules that you can easily afford to treat and eliminate even the chocolate stains on white linen. In turn, not forget that such contamination it is necessary to fight as soon as possible. Because the longer you stretch the time with the Laundry, the harder you will remove the stain. Before using any recipe for cleaning clothes (especially on the painted fabrics), test it first somewhere on the wrong side, the hem or seam. When removing stains it is necessary to carefully remove the dust with a brush, otherwise after cleaning, linen can be rustici. Withdraw stain from the wrong side of the garment, placing her sheet of blotting paper (paper towel) or a small plate, which is covered with several layers of white cloth. Clean the stain with a cotton swab or soft white cloth. First, soak the area around the spots with a swab, then make a gradual transition from the edge to the middle. In this case, the stain will not spread. Begin to clean with a weak solution, gradually increasing its concentration. In order to prepare a solution that will help you to get rid of stains of chocolate on the clothes, take 3 parts denatured alcohol, 1 part ammonia. Both ingredients mix and apply on pollution. Then, after a few seconds, rinse with a mixture of soapy water and rinse the clothes. Also bring a fresh stain, left over from the chocolate, otherwise: soiled piece of clothing pull over for some pot and slowly this place drip with cold water. From time to time to RUB the stain with your fingers. If it persists, then further moisten a cloth with glycerin and then rinse with water. According to the popular ways stains from chocolate can be removed if you RUB them with a mixture of glycerine and egg yolk. After that wash the thing with warm water and iron through a damp cloth on the reverse side. 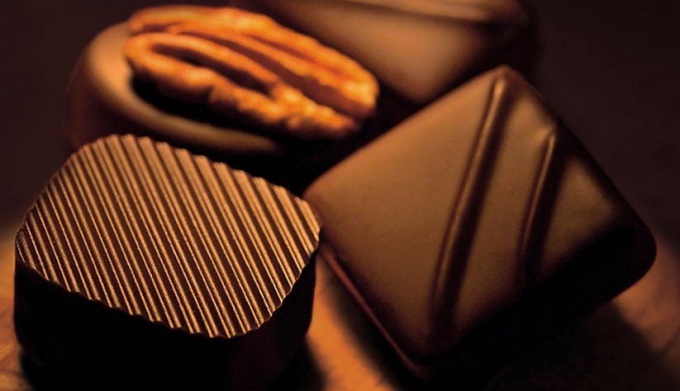 With woolen fabrics can get stains from chocolate with a gasoline soap. Soak the contaminated area with a few drops of this soap and will scrape with a dull knife. Then moisten a cloth with soap and wipe with cotton wool soaked in a light gasoline.